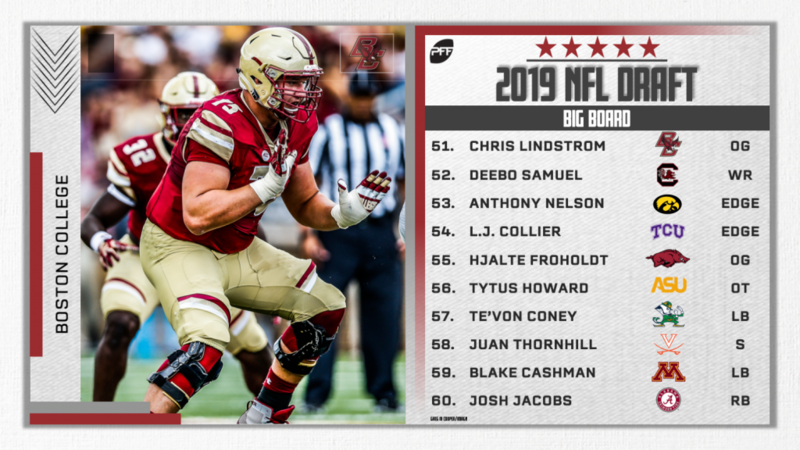 Pro Football Focus’ Top-250 Big Board for the 2019 NFL Draft is live! 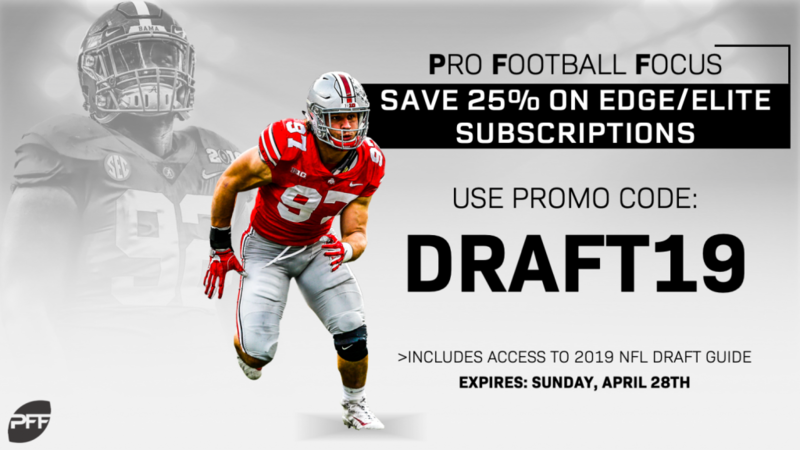 PFF’s team of draft analysts, led by Steve Palazzolo and Mike Renner, have put together their top-250 prospects as the draft closes in. Long allowed all of 18 catches on 595 coverage snaps in his entire college career at Michigan. The former tackle kicked inside to guard this past season and allowed only four pressures all season long. Samuel broke an absurd 21 tackles on only 62 catches this past season and had a fantastic week at the Senior Bowl. Nelson has been one of the most productive edge defenders in college football over the past two seasons and has the size to kick inside at times as well. Collier improved every year at TCU and then went to the Senior Bowl and had the highest win rate of any player in the one-on-ones. Froholdt played both center and guard during his tenure with the Razorbacks. This past season, he was one of the nation’s best pass protectors, allowing five pressures all season long. Howard held up very well in his time against FBS competition, pitching a shutout on 38 pass-blocking snaps against Auburn this past season. He also had the highest win rate of any tackle in the 1-on-1s at the Senior Bowl. Coney’s 90.5 coverage grade and 91.7 run-defense grade last season both ranked top-10 among all linebackers in college football. Thornhill has the ball production (13 career picks including six this past season) and had the most freakish measurables of any safety at the combine. Cashman earned a 90.0-plus overall grade this past season and tested out as one of the most athletic linebackers in the class at the combine. A whopping 41.0% of Jacobs’ carries resulted in either a first down or a touchdown in 2018, the highest rate in the country. Harry has been one of the toughest receivers to bring down in college football, racking up 38 broken tackles in his three seasons. No player in the FBS rushed the passer more than Dre’Mont Jones’ 500 snaps this past year. The man simply didn’t come off the field and still produced a 90.5 pass-rushing grade. Bingham’s 31.7 percent win rate was the highest among all defensive linemen in college football this past season. Edoga is slightly built and needs to add more muscle to his frame, but he is already stingy in pass protection. He allowed four pressures all last season. McGary stands an imposing 6-foot-7 and has rare athleticism for a man his size. He has some of the most dominant reps in the run game of any tackle in this class. He got exposed more down the stretch this season, but Thompson made plays from centerfield that few NFL safeties are even capable of. Sternberger might not have the size or athleticism of others in this class, but all he did was produce. He had the highest receiving grade of any tight end in the country. McLaurin’s production doesn’t tell the whole story, as he was one part of a loaded Ohio State receiving corps. He put on a show with his deep speed and route running at the Senior Bowl. Ya-Sin has the size and length NFL teams covet at the cornerback position. The longest reception he allowed all season was only 17 yards. Jones overcame one of the lowest-graded offensive lines in college football this past season to earn an 81.9 overall grade. Georgia had an embarrassment of riches at the playmaker positions, which held Ridley to only 60 targets last season. Like his brother Calvin, Riley is an exceptional route runner, but unlike Calvin, lacks top-end speed. Crosby has some of the best bend of any edge rusher in this class. He earned grades of 88.2 and 90.6 the past two seasons. Dean is an absurdly large cornerback who you might even mistake for a linebacker on tape. That’s before he starts moving, though, as Dean tested as one of the best athletes at the position in Indy. Davis allowed all of four pressures on 234 pass-blocking snaps this past season between tackle and guard. He’ll end up at the latter in the pros. Omenihu was much more of a run-first player at Texas, but he flashed pass-rushing ability when he was given the green light to attack. Not many pass-rushers have his combination of size, length and athleticism. McGovern played center in 2017 and guard in 2016 and 2018. He allowed only 15 pressures on 464 pass-blocking snaps this past year. Johnson suffered from a downgrade in quarterback play this past season and developed a bad drop habit (9), but he’s one of the most electric route runners and playmakers in college football. Blair flies around the back half of the field with a recklessness you can’t help but respect. He earned an 88.0 coverage grade this past season. Montgomery broke the PFF record with 100 broken tackles on 258 carries this past season. McCoy struggled a bit in the 1-on-1s at the Senior Bowl, winning only 21 percent of his pass pro reps. His tape suggests a player though that’s one of the most complete interior linemen in this class. 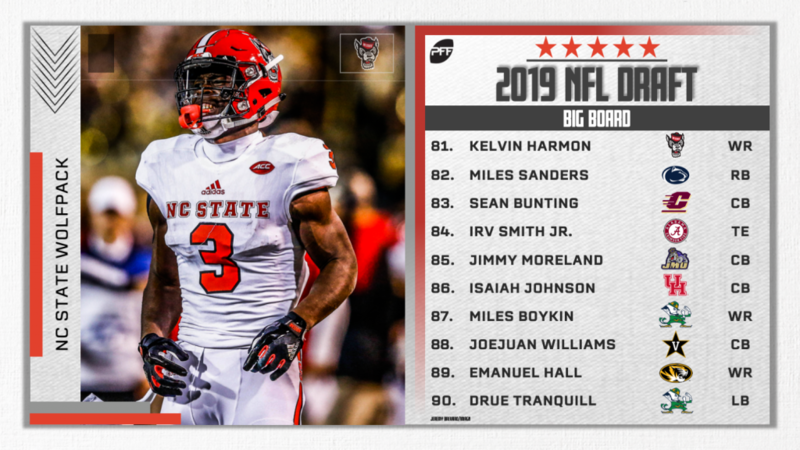 Harmon’s production at NC State was off the charts, but there are legitimate concerns as to whether he can separate enough to win in the NFL. Sanders needs to get his fumbling problem cleaned up (five this year), but he picked up right where Saquon left off for the Nittany Lions. Bunting gave up all of 17 catches this past season on 374 coverage snaps while picking off two passes and breaking up five more. Smith is more H-back size than in-line tight end, but he has the athleticism and receiving ability to be a downfield threat at the position. Moreland leaves JMU as their all-time leader in interceptions with 18. He’s as physical as you’ll see a 5-10 corner. If you were to put together what a perfect cornerback would look like physically, you’d get Johnson. He’s only been playing the position for two years and shown marked improvement over that time. Boykin has some of the best hands in college football with only three drops on 62 catchable passes this past season. Williams has prodigious size and length, but his on-field performance vacillated wildly week-to-week. Hall is arguably the draft’s most explosive receiver. His ball skills are concerning, though, as he dropped 12 of his 82 catchable targets the past two seasons. Tranquill has been one of the best coverage linebackers in college football over the past couple seasons after earning an 83.3 coverage grade in 2018 and 90.1 in 2017. Tell could be seen as a cornerback for a lot of NFL teams with his length, fluidity and off-the-charts athleticism. He also lacks the physicality many require from the safety position. Gaines was one of the best run defenders in college football but flashed some pass-rushing chops at the Senior Bowl, where he had the third-best win rate among interior players in the 1-on-1s. Tate played tackle at Memphis but projects inside in the NFL. He earned an 86.0 pass-blocking grade this past season and allowed all of 10 pressures. Finley lacks the type of arm strength most would like to see at the NFL level, but throw for throw he’s one of the most accurate QBs in the class. Oliver is one of the most physically imposing tight ends in the draft class. His 16 contested catches led all tight ends in college football. Campbell was electric playing out of the slot position for Ohio State, but he is a pure projection at this point. Only 21 of his 111 targets this past year came 10-plus yards downfield. A torn quad might hurt his draft stock, but Cajuste is one of college football’s most accomplished pass protectors. On 885 pass-blocking snaps the past two seasons, he allowed only 25 pressures. Polite came out of nowhere to notch the second-best pass-rushing grade among Power-5 edge-rushers. His lackluster testing drives him down this board, but his production in 2018 keeps him from falling completely out of the top-100. Keke was played a bit out of position on the edge at A&M and should kick inside in the league. He dominated rushing from the interior at the Senior Bowl with the highest win rate among all DTs. Joseph’s high-end plays make you think he can be an elite linebacker in the NFL, but his consistency leaves a lot to be desired at this point. 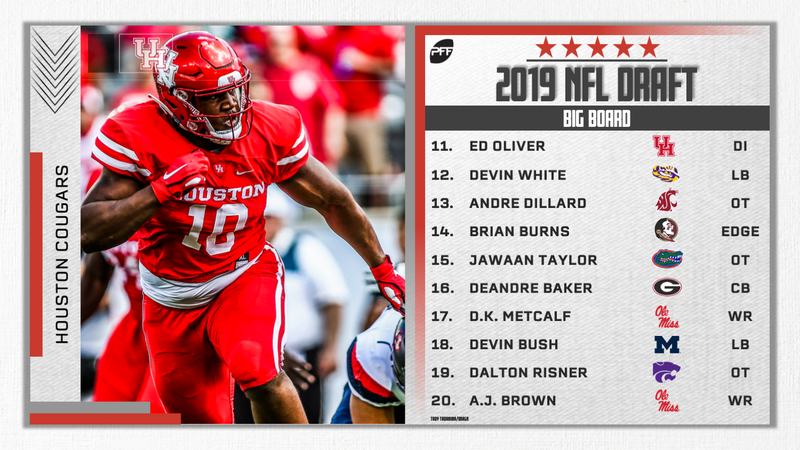 Burr-Kirvin ranked second behind LSU’s Devin White in coverage grade (91.2) in 2018, and his 91.2 overall grade ranked fourth among draft-eligible FBS off-ball linebackers with 400-plus defensive snaps played. Still learning the position, TCU’s Banogu earned just a 72.1 overall grade playing edge defender for the Horned Frogs in 2018 but has unparalleled with his ideal size and athleticism. Ximines earned a 90.2 overall grade and a 91.7 pass-rush grade in 2018, ranking tied for seventh and third, respectively, among FBS edge defenders entering the 2019 NFL Draft with 400-plus defensive snaps played. Peavy’s 90.3 overall grade in 2018 ranked fourth in the class at cornerback, and his 86.6 coverage grade ranked 12th. Deiter finished the 2018 season ranked third in overall grade (82.2) and third in run-blocking grade (82.8) among guards with at least 400 offensive snaps played. 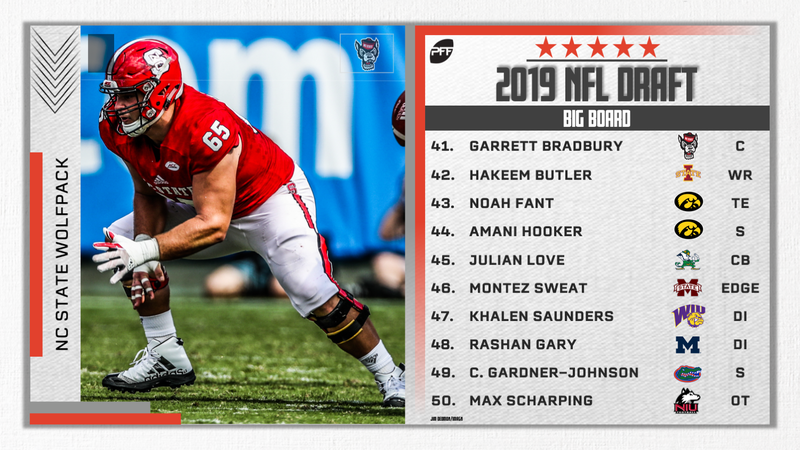 Among draft-eligible FBS centers with at least 400 offensive snaps played in 2018, Gaillard ranked inside the top-10 in overall grade (78.2) and run-blocking grade (77.1). He also earned an impressive 77.9 pass-blocking grade in 2018, allowing just eight total pressures across 353 pass-blocking snaps. Allowing just 20 total pressures across his 441 pass-blocking snaps in 2018, Evans earned an impressive 78.2 pass-blocking grade playing left tackle for Oklahoma. He earned 76.8 and 86.2 overall grades playing right tackle in 2016 and 2017, respectively. Playing 275-plus pass-blocking snaps for the Bulldogs in each of the past three seasons, Calhoun has earned 70.0-plus pass-blocking grades since his 2016 campaign. A former edge defender turned off-ball linebacker in 2018, Takitaki earned an 88.6 run-defense grade with BYU, ranking tied for 13th with Kansas’ Joe Dineen Jr. among qualifiers. Takitaki also earned a 75.9 coverage grade across 365 coverage snaps in 2018. Crawford earned an impressive 82.4 coverage grade across his 331 coverage snaps in 2018, allowing just 15 receptions from 38 targets for 162 yards and one touchdown in the process. Harris didn’t breach the top-50 in terms of overall grade in this year’s safety class, but he has turned in 74.0-plus overall grades as a primary player in Boston College’s defense in each of the past three years. Abram is a hard-hitting safety prospect drawing interest from NFL circles as a versatile piece with upside as a box safety or slot cornerback. He earned an impressive 83.1 pass-rush grade across 54 rushes and earned an 80.4 run-defense grade in 2018. Love led all running backs in the 2019 draft class with at least 300 offensive snaps played in 2017 in overall grade (91.6) and rushing grade (91.4), but injury struck in 2018 and prevented him from returning to form. If the 2017 version of Love ever surfaces in the NFL, he’ll be quite the steal in this year’s draft. Knox earned a 75.3 run-blocking grade across 223 run-blocking snaps with Ole Miss this past season, ranking third in the draft class. Earning an 84.7 pass-rush grade and a 90.3 run-defense grade, Pratt turned in the seventh-best overall grade (90.3) among qualifying off-ball linebackers in this class in 2018. 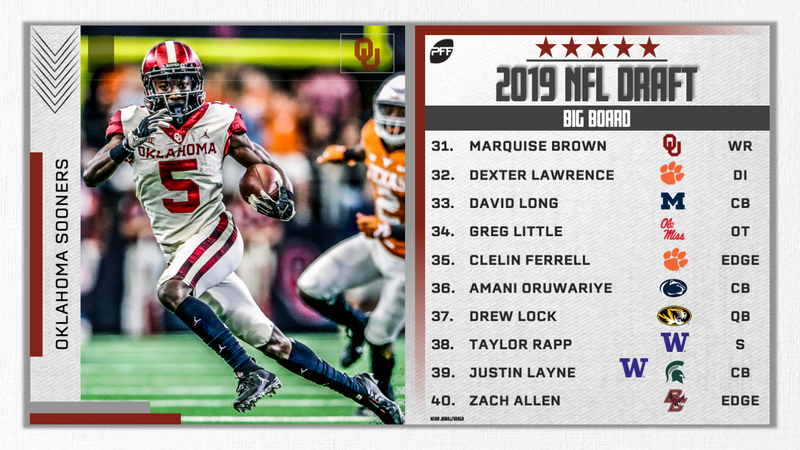 A nasty finisher and coveted for exactly that, Oklahoma’s Samia has a lot of uncoachable traits NFL coaches will fall in love with in this pre-draft process. He finished his 2018 campaign ranked 34th in pass-blocking grade at 78.3. Virginia’s Bryce Hall will get ample attention as part of next year’s class, but his teammate, Harris, is also a very talented cornerback prospect. He earned the 11th-best coverage grade (87.1) in the class this past season. 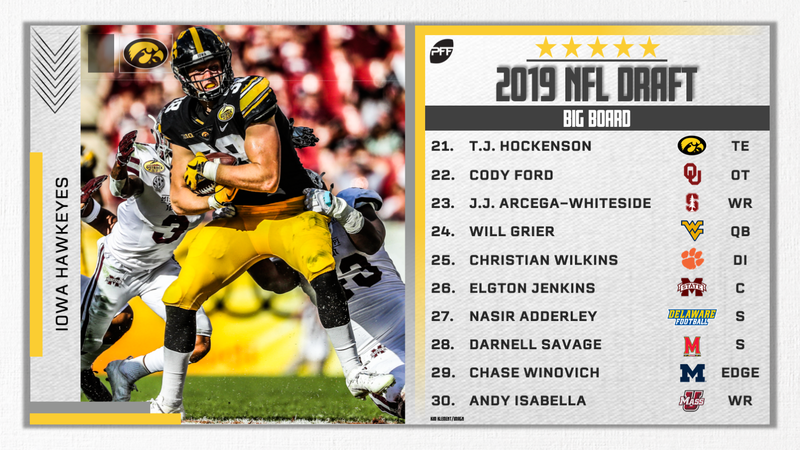 An older prospect entering the 2019 NFL Draft at 23 years old, Willis earned an 88.3 run-defense grade in 2018, ranking tied for 12th in the 2019 draft class. Henderson is a big play waiting to happen. He recorded a class-high 27 runs of 20-plus yards in 2018; no other running back entering the draft had more than 17 such runs. Long earned an 83.5 pass-rush grade across his 129 pass-rush snaps in 2018, ranking 10th among off-ball linebackers with 50 or more pass-rush snaps. Among FBS tight ends entering this year’s draft with 400-plus offensive snaps played in 2018, Wilson ranked third in overall grade (85.6) and receiving grade (90.3). Bates earned an 81.0 overall grade across his 879 offensive snaps split between left and right tackle at Penn State a year ago, but size and power concerns should push him inside to guard in the NFL. An explosive interior offensive line prospect, Jordan explodes out of his stance in the run game but still needs to learn the nuances of the position before he can claim a starting spot in the NFL. He earned sub-70.0 overall grades in each of the past two seasons. Watts turned in an impressive 86.1 pass-rush grade with Arkansas in 2018, ranking seventh among draft-eligible interior defensive linemen. Singletary’s size, or lack thereof, is reason for concern, but it doesn’t discredit the success he had running the football for FAU in recent years. In 2018, he ranked second among all backs with at least 100 attempts in forced missed tackles per attempt (0.36). Williams’ laundry list of off-field concerns will keep him from going high in the 2019 NFL Draft, but his play on the field is special enough for him to hear his name called. He earned an 84.6 overall grade as the Rams’ top target in 2018, ranking tied for 11th in the class. Wilson checks a lot of boxes in that he’s as a former five-star recruit coming out of Alabama, but he’s yet to prove he can turn his limitless potential into results on the field. In his last two years with the Crimson Tide, Wilson earned sub-72.0 overall grades. Fulgham earned a career-high 80.2 overall grade in 2018, catching 63-of-107 targets for 1,083 receiving yards and nine touchdowns in the process. Denis turned in an underwhelming 59.9 overall grade at safety for Boston College a year ago, but his 90.9 overall grade in 2017 gives reason to believe he can turn things around in the NFL. Smith earned a 75.8 overall grade and a 76.5 receiving grade in 2018, ranking 13th and 14th, respectively, among draft-eligible tight ends with 300-plus offensive snaps played. Among off-ball linebackers in the 2019 class with 400-plus defensive snaps played this past season, Edwards ranked fifth in overall grade (90.8) and 12th in coverage grade (84.8). Marshall recorded a 30.2% forced incompletion percentage in 2018, ranking fourth among draft-eligible cornerbacks with at least 25 targets. Temple’s Dogbe earned an impressive 84.5 run-defense grade in 2018 and now has earned 82.0-plus run-defense grades in three straight seasons with the Owls. A high-cut, powerful back coming out of Nebraska, Ozigbo gained at least two yards after contact or more than 70 percent of his runs and earned an 82.7 overall grade in 2018. Though he didn’t receive a Combine invite, Ozigbo should see significant interest in this year’s draft. 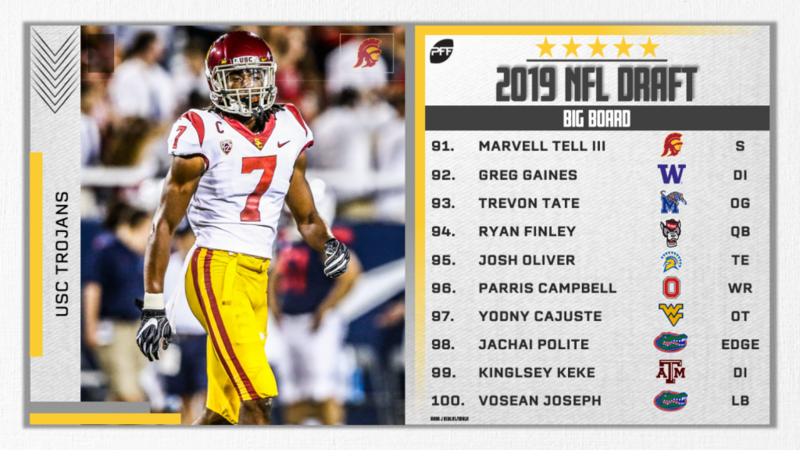 Harris ranked tied for seventh in overall grade with Ozigbo at 82.7 in 2018. He also earned an 84.4 rushing grade, ranking 12th in the class. Powers earned 87.8 and 88.9 pass-blocking grades with Oklahoma in 2017 and 2018, respectively. He allowed just 21 total pressures across 1,177 pass-blocking snaps in his three-year college career. Colorado’s 6-foot-2, 210-pound Worthington earned a 75.0 overall grade in 2017 and a 70.0 overall grade in 2018 playing a mix of slot cornerback, box safety and free safety in the two-year span. Anderson played just 35 offensive snaps before suffering a season-ending knee injury in 2018. In the year prior, he earned an 80.3 overall grade and a 79.9 rushing grade. Among draft-eligible edge defenders with at least 300 defensive snaps played in 2018, Walker ranked 22nd in overall grade (81.9) and 25th in run-defense grade (79.8). Prescod turned in career-high grades across the board in 2018, earning an 86.0-plus overall, pass-blocking and run-blocking grade across his 681 offensive snaps. Jackson’s 85.5 pass-rush grade in 2018 ranked tied for 14th in the class. He totaled 54 pressures across 286 pass-rush snaps and ranked eighth in pass-rush win percentage (21.7%) among qualifiers. Redwine earned career highs in overall grade (81.6) and coverage grade (85.9). He also recorded 35 defensive stops in 2017 and 2018 combined. Ferguson recorded 64 total pressures in 2018, the third-most of any FBS edge defender in this year’s class. He also ranked fifth among qualifiers in pass-rush win percentage at 23.4%. Hill is an explosive athlete with a lot of potential at the next level. He earned 78.7 overall grades in 2017 and 2018 while playing 400-plus defensive snaps in each of the two seasons. Wren is naturally gifted with great size, explosiveness and athleticism, but he struggles with consistency. He failed to produce an overall grade above 80.0 once in the last three years of his Arizona State career. Willis earned career highs in overall grade (86.0) and coverage grade (86.3) with the Spartans in 2018. Dortch is a smaller receiver that will need to make his money in the slot at the next level. He, however, got the job done at Wake Forest, earning 80.0-plus overall grades in 2017 and 2018. Scarlett was suspended for the entire 2017 season, putting his future in the NFL in jeopardy. But the Florida back returned to form in 2018, earning the fourth-best rushing grade (86.4) in the 2019 class. Higdon is a powerful back with explosive jump cuts. He earned a 76.3 rushing grade with Michigan a year ago and has now earned 73.0 rushing grades in each of the past three years. Brown is a big, physical cornerback who dominated lesser FCS competition in his career at South Dakota State. Smith finished the 2018 season ranked inside the top-20 in run-stop percentage (12.6%) and tackling efficiency (17.20), both helping him to career highs nearly across the board. An aggressive, smaller cornerback, Cheevers projects as a talented slot cornerback in the NFL that can thrive in the short and intermediate areas of the field. He earned an 84.2 overall grade in 2017 and an 89.2 overall grade in 2018. His usage took a hit this past season, but 19 of Raymond’s 27 catches this past season still resulted in first downs. Mitchell turned in a career year with the Ducks in 2018, earning an 80.8 overall grade and an 82.5 receiving grade in the process. He also ranked 11th in yards per route run (2.90) among draft-eligible FBS wide receivers with 300 or more routes run in 2018. Among edge defenders with at least 400 defensive snaps in 2018, Miller ranked 27th in overall grade, tied for 32nd in run-defense grade and tied for 18th in pass-rush grade. He’s a raw prospect with untapped potential having played fewer than 700 defensive snaps in his Crimson tide career. Mack performed well at the Senior Bowl and turned in a strong 2018 season with Texas A&M in 2018, earning an 80.2 overall grade and an 81.2 run-defense grade across his 491 defensive snaps. Jennings finished the 2018 season ranked just behind Iowa State’s Hakeem Butler in overall grade, earning an 81.4 mark across 589 offensive snaps. He also ranked 15th among draft-eligible FBS wide receivers with at least 300 routes run in yards per route run at 2.69. Okereke didn’t break the top-20 in terms of overall grade in 2018, but his size and athleticism combine for a project worth taking on in the later rounds. Reed, who is listed at 6-foot-2, 232 pounds, will likely make the transition from edge defender to off-ball linebacker at the NFL level after finishing the 2018 season with a Group of 5-high 50 defensive stops. Mullen’s height and length will have NFL coaches eager to mold him into something special at the next level, but he’ll need to improve significantly in order to make the leap. He earned just a 73.5 coverage grade a year ago and failed to earn coverage grades above 80.0 in the two years prior. Weighing in at 6-foot-2, 213 pounds at the Combine, Johnson is another long cornerback with a ton of potential going onto the NFL. He earned a 72.0 coverage grade and allowed an 84.0 passer rating when targeted in 2018, ranking outside the top-50 draft-eligible FBS cornerbacks in both categories. 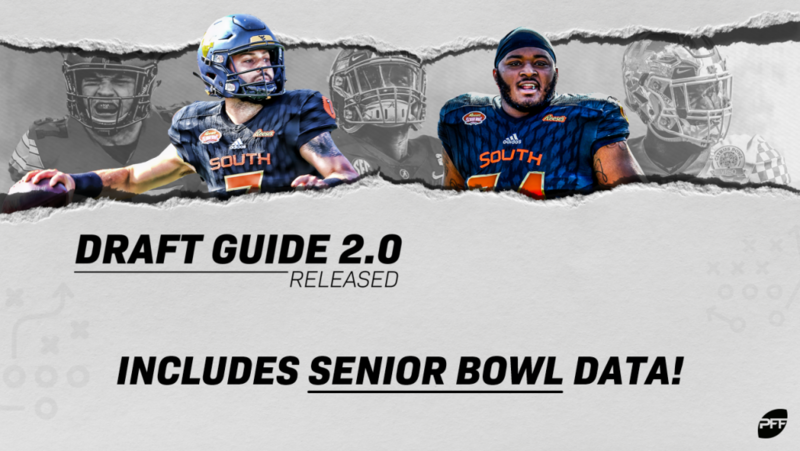 Ballentine turned heads with his level of play at the Senior Bowl. He had the fifth-best win rate among all corners in the one-on-ones in Mobile. Among guards with at least 400 offensive snaps played in 2018, Benzschawel ranked first in overall grade (89.3), tied for seventh in pass-blocking grade (88.6) and first in run-blocking grade (88.9). Hollins is a raw edge prospect with all of the natural tools to excel at the next level if he can improve his technique and add a bit of weight to his frame. He ranked 16th in the class in overall grade (83.4) and logged a career-high 85.3 pass-rush grade in 2018. Ohio State’s Prince allowed earned the fifth-best run-blocking grade (79.7) among offensive tackles with at least 400 offensive snaps played in 2018. Rypien’s 91.8 passing grade from a clean pocket ranked tied for third with NC State’s Ryan Finley in the 2019 draft class. Miller brings admirable size (6-foot-4, 254 pounds) and athleticism to the table, but the Penn State alumnus still has a long way to go before he’s a finished product in the NFL. He earned just a 72.8 overall grade and a 71.4 pass-rush grade in 2018. A true burner at the wide receiver position, Hardman wins with speed with the best of ’em in this class and can be a nightmare after the catch. The former Georgia standout averaged 8.3 yards after the catch per reception a year ago, ranking inside the top-20 draft-eligible FBS wide receivers. More than just a sweet mustache, Minshew led all draft-eligible FBS signal-callers with at least 300 dropbacks a year ago in adjusted completion percentage (80.7%). A freakishly athletic, compact running back coming out of Utah State, Thompson averaged 0.32 forced missed tackles per attempt and 5.1 yards after contact per attempt in 2018, ranking inside the top-five in both categories. Among draft-eligible FBS wide receivers with at least 100 targets over the past two seasons, Johnson ranked tied for first in receptions of 15-plus yards (61) and second in yards per route run (3.48). 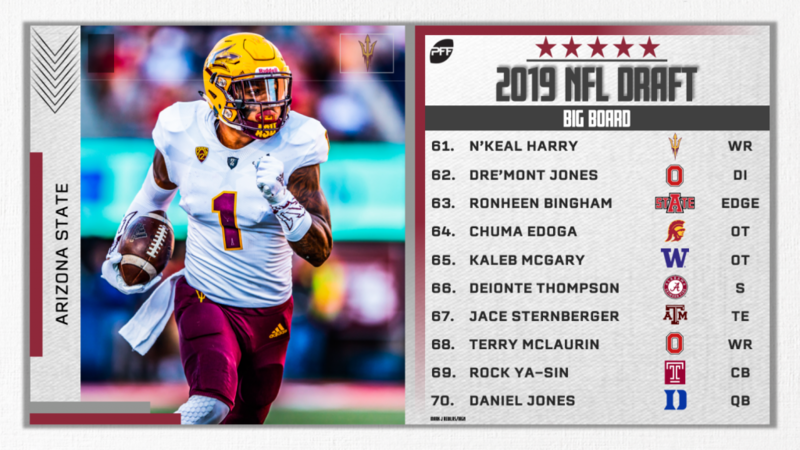 Giles-Harris earned an impressive 91.2 overall grades across his 1,433 defensive snaps in 2017 and 2018 combined, ranking eighth among draft-eligible off-ball linebackers with at least 600 defensive snaps played in the last two seasons. Johnson finished his 2018 campaign ranked tied for fourth in receptions of 15-plus yards (33) and 10th in yards per route run (3.05) among qualifiers at his position in this draft. Built like a freight train, Mattison brings a rare combination of size, athleticism and football IQ to the table. The 5-foot-11, 221-pound back recorded a top-five 10-yard split at the Combine and forced the third-most missed tackles of any back in the draft-eligible FBS in 2018. Cominsky testing at the combine in Indy was on par with Rashan Gary, but he’ll have a massive jump in competition coming from Charleston. Armstead is a big, punishing back that will make his money bowling through defenders on a train track in 2018. He earned a 77.8 rushing grade in 2018, ranking 32nd among draft-eligible FBS backs with at least 100 attempts. Williams averaged just 3.4 yards after contact per attempt and 0.13 forced missed tackles per attempt with the Fighting Irish in 2018, but he flashed high-end potential in bursts and impressed many with his big-play ability. At 6-foot-2, 242 pounds, Dodson is one of the bigger off-ball linebackers in this class, but he failed to produce at a high level in his last two seasons with Texas A&M. He earned just 72.4 and 68.8 overall grades in 2017 and 2018, respectively. Amadi has over 1,000 defensive snaps played at wide corner and slot corner in his college career but should make the transition to safety role in the NFL. When he earned a career-best 83.8 overall grade in 2017, he played 50 defensive snaps at free safety, 97 in the box and over 300 in the slot. Skule earned a 74.1 overall grade and a 79.7 pass-blocking grade with Vandy a year ago, but he struggled in the run game a bit. He earned just a 69.7 run-blocking grade in 2018, ranking tied for 28th in the class. The 6-foot-3, 305-pound Huggins is a former four-star recruit that struggled to find the field as part of such a talent-laden defensive line at Clemson. He earned 71.1-plus overall grades in each of the last three seasons with the Tigers while playing at least 200 defensive snaps each year. Gant led all draft-eligible FBS safeties with at least 400 defensive snaps played in overall grade (90.7) in 2018. He also ranked second in run-defense grade (90.1) and fourth in coverage grade (89.4). A former five-star recruit coming out of Florida’s IMG Academy in 2016, Smith has all of the potential in the world to succeed at the next level; he just needs to add polish to his outstanding natural ability. He ranked tied for 40th in overall grade (78.3) and 37th in coverage grade (78.2) in what was his only collegiate season with more than 50 defensive snaps played. Anchored by his impressive 87.5 pass-blocking grade, Sweet finished the 2018 season ranked sixth in overall grade (81.2) among FBS tackles entering the 2019 NFL Draft with 400-plus offensive snaps played a year ago. Homer is a talented, athletic back that can make a living at the next level catching passes out of the backfield or beating defenses to the edge on outside runs. He’ll need to improve his play between the tackles to find a primary role in the NFL. He earned 74.4 and 68.0 overall grades in 2017 and 2018, respectively. He may not look the part, but Renfrow is a crafty slot receiver that can add immediate value to an NFL offense in 2019. He earned a 75.1 receiving grade when lined up in the slot in 2018, ranking 16th among draft-eligible wideouts with at least 200 routes run from the slot. Elliss earned an impressive 87.7 overall grade playing a mix of edge defender and off-ball linebacker for Idaho in 2017. Jelks is a versatile defensive lineman with experience up and down the Ducks’ defensive line. He earned a career-high 82.2 overall grade playing mostly interior defensive lineman in 2017 but will likely need to carve out a role at edge defender in the NFL. Thompson earned an 88.2 overall grade and a 91.0 run-defense grade in 2018, ranking 10th and eighth, respectively, among draft-eligible interior defensive linemen with 300-plus defensive snaps played in 2018. At 5-foot-10, 198 pounds, Hill is a lightning-quick back that can be mismatch nightmare at the next level. His 4.40s 40-yard dash and 1.48s 10-yard split helped him to an 80.6 overall grade and 84.5 rushing grade this past season. Barnes is a gym rat with notable strength and athleticism coming out of Kansas State. He’s a patient back that sets up his blocks well and can bury defenders with a lowered shoulder. He earned 76.2 and 72.7 overall grades in 2017 and 2018, respectively. Among draft-eligible FBS tight ends with at least 300 offensive snaps played in 2018, Sample ranked 14th in overall grade (75.5) and first in run-blocking grade (82.3). Meyers doesn’t create great separation at the short and intermediate level, but he brings notable consistency, contested-catch ability and solid hands to the slot receiver position. He finished the 2018 season ranked in the top-five in contested catch percentage and drop rate. Walker is a run-stuffing defensive interior player with limited upside as a pass-rusher in the NFL. He earned a 76.9 overall grade and a 77.9 run-defense grade with Virginia Tech a year ago and failed to earn pass-rush grades above 77.0 in any year of his collegiate career. Injuries limited Fields to just 400 defensive snaps in 2018, and he earned just a 63.1 overall grade when healthy enough to suit up for Clemson. He earned a career-high 76.8 overall grade in 2016 but failed to get above 70.0 in the two years following his sophomore campaign. Needham earned a 77.6 coverage grade with UTEP in 2018, allowing receptions on just 31-of-51 targets for 195 yards in the process. He also recorded 15 defensive stops in coverage, ranking tied for fifth among qualifiers. Minnesota’s Huff finished the 2018 season ranked fifth in overall grade (88.8) and coverage grade (89.1) among FBS safeties entering the 2019 NFL Draft with 400-plus defensive snaps played. He also ranked sixth among draft-eligible safeties with 250 or more coverage snaps played in forced incompletion percentage (31.6%). Lamar is a two-down off-ball linebacker at the next level. He wowed against the run with Clemson this past season, earning a 90.5 run-defense grade, but he’s a liability in coverage. 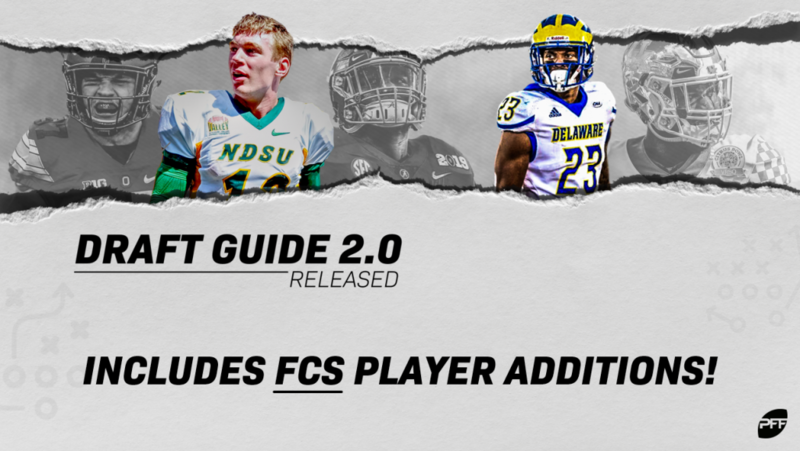 Likely too small to play edge defender at the next level, the 6-foot, 233-pound Smith should make the transition to off-ball linebacker and bring pass-rush upside in the NFL. He recorded 65 total pressures as an edge defender with Northern Illinois in 2018, good for the second-most pressures in the FBS. Moreau finished the 2018 season ranked 12th among draft-eligible FBS tight ends in overall grade (76.5) and 10th in receiving grade (82.1). He caught 22-of-27 targets for 272 yards, 12 first downs and two touchdowns while dropping just one pass on the season. After earning a 78.0 overall grade and an 89.2 run-defense grade in 2017, Buggs regressed in a larger role in 2018. Predominantly playing edge defender, he earned a 71.6 overall grade and a 74.7 run-defense grade across 747 defensive snaps this past season. Randall isn’t a household name in the 2019 class, but he did produce like one this past season. He earned an 89.0 coverage grade on the year, ranking sixth among draft-eligible FBS safeties with at least 400 defensive snaps played. Hartage earned an 80.8 coverage grade and an 82.0 overall grade in 2018, ranking inside the top-20 in both categories among draft-eligible cornerbacks. Brailford earned a career-high 77.8 overall grade with Oklahoma State a year ago, but he still has a ways to go before he’s an impact player in the NFL. Carney is a run-first edge defender with limited upside as a pass-rusher, but what he does well he does really well. He ranked tied for 10th among qualifying draft-eligible edge defenders in run-defense grade (85.6) in 2018. Weighing in at 6-foot-3, 281 pounds, Kansas’ Wise should move inside at the next level after playing edge defender with the Jayhawks in 2018. He earned a strong 83.1 run-defense grade a year ago, ranking 17th among qualifiers. Williams earned the best receiving grade (90.7) of any draft-eligible back with at least 300 offensive snaps in 2018. His receiving chops should give him early opportunities in the NFL on passing downs. Pierschbacher, a four-year starter for the Crimson tide, earned a career-high 76.2 pass-blocking grade in 2018. He earned 67.7-plus overall grade all four years of his collegiate career. Stick earned a 91.1 overall grade this past season albeit against FCS competition. He’s a fantastic athlete as well who’s leagues are a real threat. Earning a 75.7 pass-blocking grade in 2018, Nijman allowed just 12 total pressures (10 hurries, one hit, one sack) across his 334 pass-blocking snaps with Virginia Tech. Parham’s movement skills and hands for a 6-foot-8 tight end with 36+ inch arms make him an intriguing red zone threat. Egbule is a solid pass-rushing off-ball linebacker coming out of Houston. He earned an impressive 76.4 pass-rush grade and totaled 22 total pressures this past season. Stidham failed to impress in 2018, earning just a 62.3 overall grade and a 66.2 passing grade on the year. Also, his 79.6 passing grade from a clean pocket ranked just 24th among draft-eligible signal-callers with at least 200 clean dropbacks in 2018. Austin has great size and length for the cornerback position, but injuries have kept us from seeing if he can reach his potential. He played fewer than 200 defensive snaps over the past two years and earned sub-70.0 overall grades in 2016 and 2015 with Rutgers. Miller earned 80.0 and 82.4 coverage grades in 2016 and 2017, respectively, before earning just a 71.9 coverage grade in 2018. Crawford earned 76.1 overall grade and a 77.8 run-defense grade in 2018, ranking 43rd and tied for 35th, respectively. Maryland’s Gray struggled significantly in the run game but more than impressed with his play in pass protection this past season. He finished the year ranked tied for 22nd in pass-blocking grade (81.0) and allowed just seven total pressures in the process. Weighing in at 6-foot-4, 296 pounds, Beckner can be an immovable force in the run game when called upon, as evidenced by his 79.7 run-defense grade from a year ago. 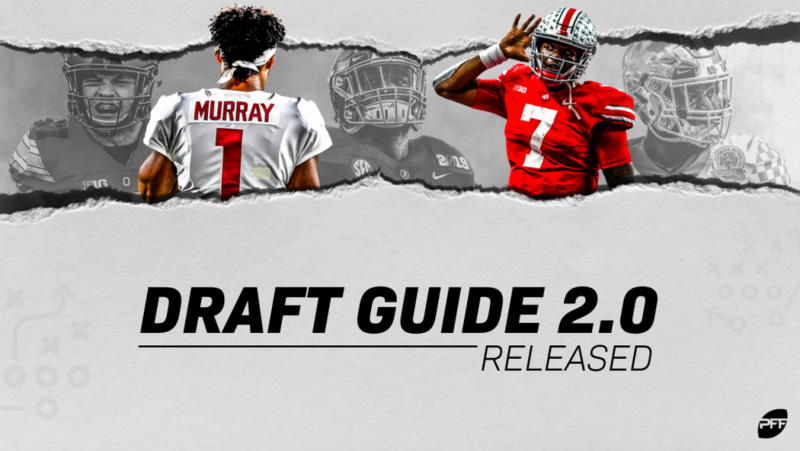 The rise of JK Dobbins pushed Weber out of the limelight at Ohio State, but he still enters the 2019 NFL Draft with a lot of talent to work with at the next level. Forcing 36 missed tackles across his 172 rushes in 2018, Weber ranked tied for 25th in the class in forced missed tackles per attempt. Roemer anchored San Diego State’s run-heavy offense with his 20th-ranked run-blocking grade (70.9) this past season. Haynes allowed just 13 total pressures (11 hurries, two sacks) across 480 pass-blocking snaps a year ago, ranking tied for 41st among draft-eligible guards in pass-blocking efficiency at 98.4. Boyd’s 90.1 run-defense grade ranked second in the 2019 class among qualifiers at his position, and he also earned strong coverage (74.2) and overall grade (76.7). Van Ginkel earned a 78.3 coverage grade across 103 coverage snaps playing along the edge of Wisconsin’s defense a year ago. He also earned a 75.3 overall grade and a 72.0 pass-rushing grade. Among draft-eligible FBS centers with at least 400 offensive snaps in 2018, Buffalo’s O’Hagan ranked first in overall grade (88.0), fourth in pass-blocking grade (88.7) and first in run-blocking grade (88.3). Russell totaled 21 run stops, including eight tackles for loss or no gain, in 2018. His 80.3 run-defense grade ranked tied for 23rd among interior defensive linemen in the 2019 draft with at least 250-plus run-defense snaps a year ago. Houston’s Myres allowed receptions on 38-of-65 targets for 411 yards and four touchdowns en route to an 85.6 coverage grade in 2018, ranking tied for 13th in the class with Ya-Sin. Sills gained 15-plus yards on 26 receptions as one of West Virginia’s top targets in 2018, ranking tied for 20th in the 2019 class. Wesco is a big-bodied blocking tight end with some upside in the passing game coming out of West Virginia. He finished the 2018 season ranked tied for seventh among draft-eligible tight ends in run-blocking grade (72.9). Brooks ranked eighth among draft-eligible cornerbacks in overall grade (88.2) and 10th in coverage grade (87.2) in 2018. He also allowed just a 61.0 passer rating when targeted despite seeing a whopping 110 targets thrown his way on the year. McIntosh finished the 2018 season ranked 22nd in the class in overall grade (80.6, 23rd in run-defense grade (80.5) and 38th in coverage grade (78.3). Mekari ranked tied for third in pass-blocking efficiency among qualifying draft-eligible tackles in 2018, but the former Cal standout is likely best suited for guard at the next level. Hansen, a former safety turned linebacker, earned the 14th-best overall grade (86.7) among qualifying off-ball linebackers in the 2019 class this past season. He also earned strong run-defense (86.9) and coverage (84.1) grades in 2018. Wyatt earned just a 66.9 overall grade in 2018, but it was far from the best we’ve seen from the former SMU standout. He earned an 82.9 overall grade and an 86.5 overall grade in 2016 and 2017, respectively. Hyatt was a four-year starter for Clemson and the epitome of consistency all throughout. He earned 71.0-plus overall grades all four years of his career while playing at least 836 offensive snaps each season. A former four-star wideout turned Texas State tight end, Brown took the long road to the 2019 NFL Draft, but his ability after the catch is among the best at the position in this class. He finished the 2018 season ranked 10th in yards after the catch per reception (7.9) among draft-eligible FBS tight ends. 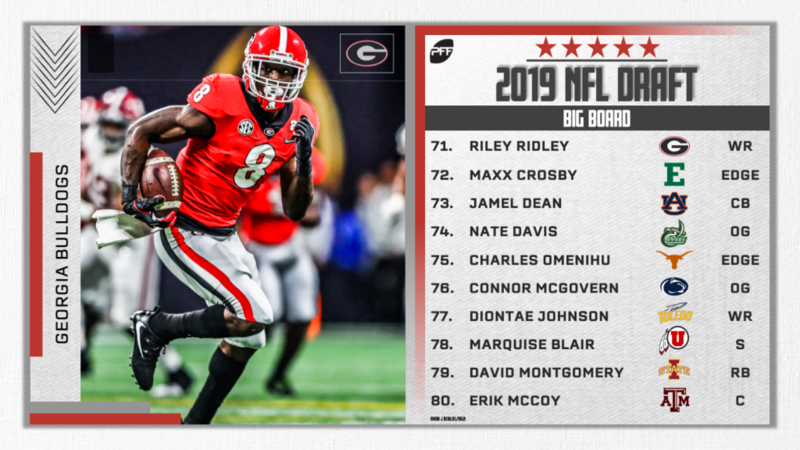 Bars ranked 13th in overall grade (75.4) and tied for sixth in run-blocking grade (75.0) among draft-eligible guards with 300-plus defensive snaps in 2018. Hawaii’s Tavai only played 252 defensive snaps in 2018, but he still logged an impressive 23 defensive stops in the run game and earned a 76.5 run-defense grade, to boot. Williams finished the year ranked tied for ninth in overall grade (82.5) and seventh in rushing grade (85.6). The hyper-productive SEC back is more than capable of carving out a significant role in the NFL. Edwards makes his money in the run game, as the former Wisconsin tackle ranked tied for ninth in the class in run-blocking grade (76.6). His 57.8 pass-blocking grade in 2018 is what drags him down to this spot. Ratliff-Williams has a lot of room to grow, but he still averaged an impressive 2.04 yards per route run with UNC a year ago. He’s a project worth taking a flyer on in the later rounds. Injuries have prevented Gustin from properly developing at the collegiate level, but he offers great upside with his natural tools. He earned pass-rush win rates above 15% in each of the last two seasons of his Trojans career. Lowery’s 88.4 overall grade was one of the best in college football this past season, but he has serious play strength concerns that need to be fixed. Gaskin ranked 31st in the class in overall grade in 2018, landing at just 76.4 across his 581 offensive snaps. He earned higher overall grades playing 400-plus offensive snaps in each of the three seasons prior to his 2018 campaign. Pollard is more slot receiver than running back. He lined up in the slot on 419 of his 600 offensive snaps in 2018, catching 39-of-60 targets for 458 yards, 18 first downs and three touchdowns in the process. Sheffield earned a 74.8 overall grade and a 76.5 coverage grade across his 804 defensive snaps with the Buckeyes in 2018. He allowed receptions on 32-of-59 targets for 553 yards and five touchdowns while logging two interceptions and seven pass breakups on the year. Roberts flashed high-end pass-rush ability with the Spartans a year ago, ranking inside the top-10 in pass-rush grade (81.8) among draft-eligible interior defensive linemen. Jackson allowed completions on 25-of-49 targets for 325 yards, 13 first downs and a touchdown in 2018, earning a 70.5 coverage grade in the process. Shelley earned an impressive 89.9 overall grade with Kansas State this past season, ranking fifth in the draft class. With his slight frame, however, Shelley will likely need to make the transition to the slot to have success at the next level. Hart earned a career-high 84.6 overall grade with Georgia State in 2017 and dropped to a 69.4 overall grade in 2018. He did, however, turn heads a the Senior Bowl and should draw attention from NFL circles as a slot option at the next level. Baity finished the 2018 season ranked 33rd among cornerbacks in the 2019 class in overall grade at 79.5. He ranked 25th among draft-eligible cornerbacks in passer rating allowed (59.1) on the year, as well.